With just a few days left until Stranger Things Season 2 debuts, Netflix has unveiled nine brief clips, and while they contain no audio from these scenes, they reveal quite a bit about this upcoming season. There are nine clips in total, which are taken from the Hawkins Lab surveillance feeds at several different locations around town. The first surveillance feed is from the Holland home, where we get our first look at Barb's father, although it isn't known who plays this character yet, and another glimpse at Barb's mother (Cynthia Barrett), who was briefly introduced last season. It's clear from this first clip alone that Barb has not been forgotten. If you still aren't caught up with the first season, there will be SPOILERS below, so read on at your own risk. The first clip is shown in the Holland residence dining room, where Barb's parents are enjoying a KFC dinner with Barb's best friend Nancy Wheeler (Natalia Dyer) and Steve Harrington (Joe Keery). This surveillance feed doesn't have any audio, so it isn't clear what is being said between Nancy, Joe and Barb's parents, but the video includes another feed from a Holland residence bathroom, where Nancy sees a photo of Barb, but she must turn it over after being overwhelmed with guilt due to the loss of her best friend. As you'll recall, Barb was taken by the Demogorgon into the Upside Down, while waiting for her friend Nancy, and it's clear that Nancy is still wracked with guilt over her friend's death. 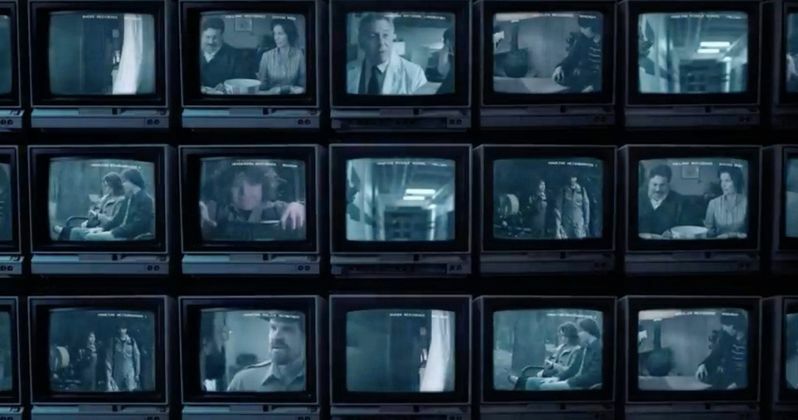 The second clip shows a feed from inside Hawkins Lab itself, with another look at Paul Reiser's character, Dr. Owens performing some tests on Will Byers (Noah Schnapp), likely as a result of his prolonged stay in the Upside Down last season. The footage keeps cutting to a display of squiggly lines, but there is no indication as to what that could mean, since there is no audio in this or any of the clips released by the streaming service. The third clip takes us to the Wheeler residence, following young Mike Wheeler (Finn Wolfhard), who is seen holding a toy version of the iconic Star Wars ship the Millennium Falcon, but he doesn't seem to be in the mood for playing, when he goes to get his walkie-talkie, before that scene cuts out. The video ends with Mike about to leave the basement, when he sees something that seems to truly startle him. The fourth clip takes us inside the bedroom of Dustin Henderson (Gaten Matarazzo), shown in his Ghostbusters costume just after trick-or-treating. Dustin is seen going through his candy haul, which reveals that their authentic Ghostbusters costumes apparently also come with ghost traps, one of which is filled with candy, as he's seen putting some bits of candy into the aquarium where his pet turtle is. The fifth clip is rather interesting since it shows the end of a previously-released clip, where Eleven (Millie Bobby Brown) is seen exiting from the Upside Down into a portal at the Hawkins Middle School. Oddly enough, there seems to be some interference in the footage, which may be due to Eleven's supernatural powers. The sixth clip shows Will and Mike out trick or treating in their Ghostbusters costumes, while Will seems to be startled by something at the end of this mysterious clip. The seventh clip takes us inside the Hawkins police station, where Sheriff Hopper (David Harbour) is seen having a chat with one of the new characters this season, Murray Bauman, a conspiracy theorist played by Brett Gelman, although whatever Murray appears to be saying, the Sheriff doesn't seem to be buying into it. The eighth clip takes us into the Byers bathroom, where Will enters with a towel wrapped around his waist, with a terrified look on his face. The final clip shows Nancy Wheeler meeting with Jonathan Byers (Charlie Heaton) on a park bench, which oddly enough cuts to a scene where both Nancy and Jonathan are in the Hawkins Police interrogation room. While the previous clips have been difficult to lip-read what the actors are saying, it's quite clear what Nancy says to the surveillance camera at the end of this clip. Take a look at all of these clips in the video player below, courtesy of Netflix YouTube.